It is a curiosity that Archie “Grey Owl” Belaney, imposter and cultural thief, is still a thing in Canada in 2017. These are sensitive political times. Ours is an era wherein the offence of cultural appropriation is called out, both when it is indeed offensive, and occasionally, when it isn’t. We lately witnessed the questioning of writer Joseph Boyden’s aboriginal ancestry. Ditto Massachusetts Senator, Elizabeth Warren. We’ve seen editors of two Toronto magazines, The Walrus and Write, resign after expressing unpopular views about cultural appropriation. Yet here we have Grey Owl—the ne plus ultra of cultural pickpockets—still brooding handsomely in his dyed braids on the Parks Canada website. 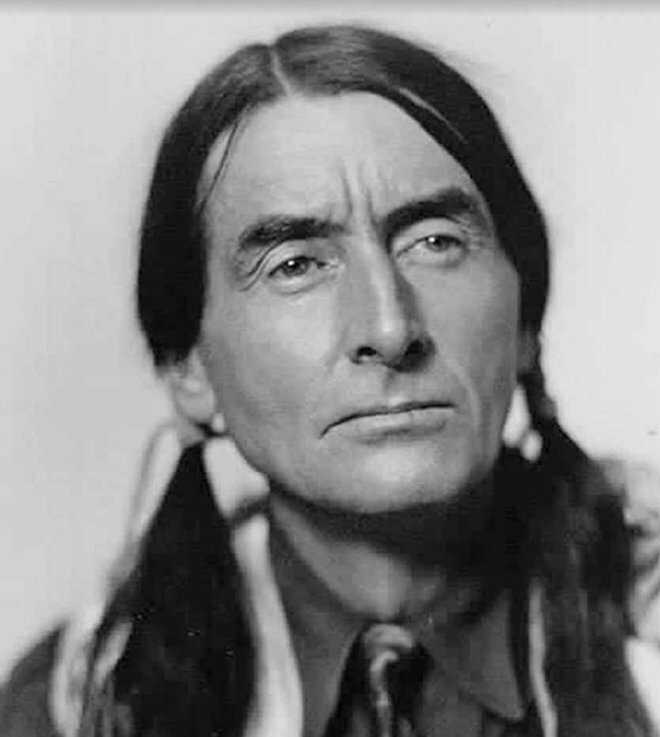 Grey Owl was a tarnished brand long before its architect died of alcoholism, pneumonia and exhaustion in 1938. I grew up in Prince Albert, the city closest to Grey Owl’s happy hunting grounds. And though we missed each other by decades, I felt like I knew him a little. My grandfather knew Archie Grey Owl from Northern Ontario, knew him as a bigamist and fake, though he and some great uncles of mine were not above pulling a cork with the famous author, who oftentimes could be observed listing three sheets to the wind along the sidewalks of Prince Albert. My grandmother liked to sum up any Grey Owl reminiscences by saying that he was never allowed in her house. Grey Owl ironically never fooled anyone close to home. I think he was too ludicrous and sad a figure to truly offend the Aboriginal community from whom he stole. As for his gullible literary following in England—where he had toured to great acclaim and even had the gall to call King George “brother”—his ruse was short-lived. “Grey Owl had Cockney Accent and Four Wives,” declared one post-mortem headline. In death, Grey Owl was quickly transformed into a figure of ridicule. Even his writing, though assuredly skillful, is decidedly quaint, purplish prose to the modern gaze. Which brings us back to the Grey Owl trailhead: why have we kept him on? For one thing it’s impossible not to be drawn to what a wise friend of mine calls “the paradox of the dissembler with great insights.” Archie was caught in his invented life like a mink in a leg-hold trap and the weight of the deception may have killed him. Yet beneath his stolen trappings, he possessed an authentic wisdom about nature and our relationship to it that retains undeniable power. Read the rest of the article in our Special Double Fall/Winter issue, available online now.